Forest Legacy held a hugely successful fundraising event on Saturday evening, 13th April 2013 at Genesis in the Hills, 124 Croyden Road, Rolleystone, Western Australia. Part of the event is/was an exhibition of photographs from my archive. 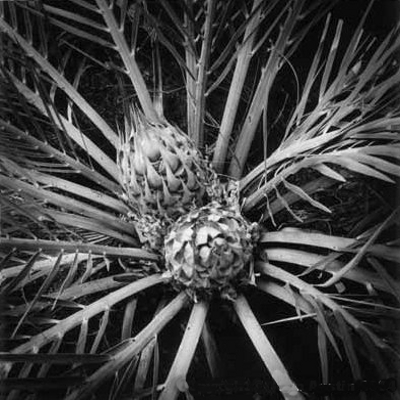 The black and white photographs are in two groups, forest protest and forest flora. In the flora photographs I am not showing the more obvious big tree images of our marri, karri and jarrah forest, neither the vast sweeps of forest devastation, but am showing pictures of the ‘rubbish’ that is swept away or ignored. Plants like Xanthorrhoea and Zamia that are ‘scrub rolled’ to make way for clear felling the ‘target species’. To anyone with any sensibility these rubbish plants are beautiful and engaging. As a photographer I remember writing in Words and Visions, Adelaide 1983, that for me working in the English landscape was natural, intrinsic and almost without thought. 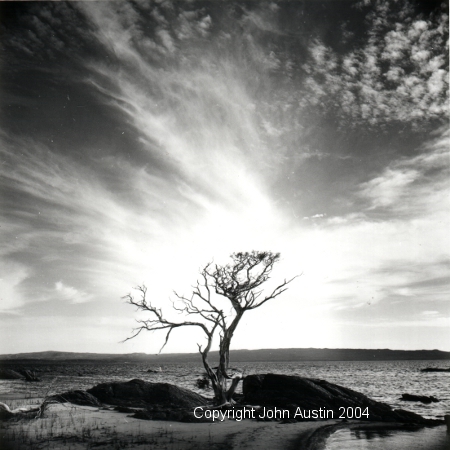 Photographing Australian landscape was then a conscious and objectified act, I was looking at it as an outsider. Having lived in the forest for almost twenty years I now feel more comfortable with the Australian landscape, but there are still times when I am near a Xanthorrhoea or Zamia who has been living in the forest for hundreds of years when I still feel alien. 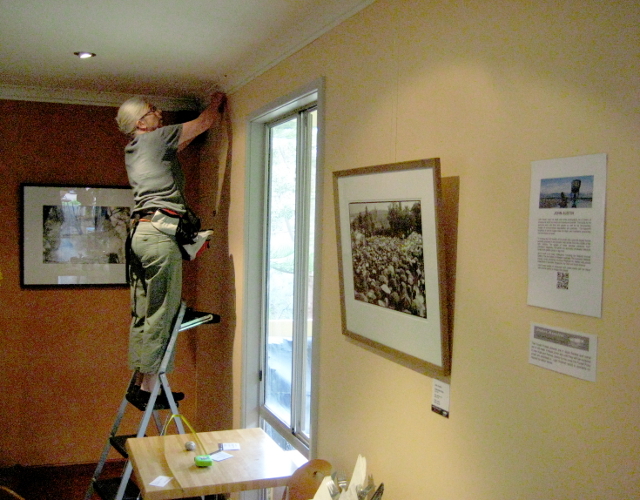 I moved to Quinninup in the Southern Karri forest intending to work in a contemplative manner. However, I quickly realised the truth about the forest I live in. 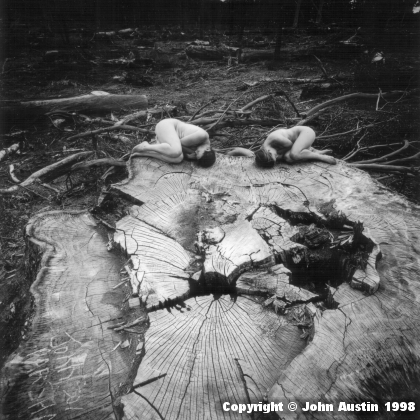 There is nothing quiet or contemplative about the violence inflicted upon SW forests. The forest protest images shown here are a tiny selection from a record of forest protest and defense actions and rallies. They show some of the means used to slow the destruction of the forest and gain media coverage. I remember being told there were two types of protesters, those that went up onto platforms and tripods and those who went down into dragons. 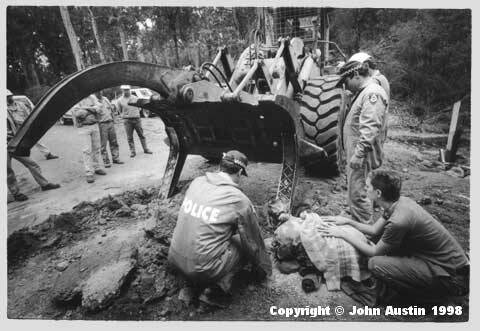 Reviewing these now fifteen year old images remind me that by late 1998, the timber industry, CALM and their police were becoming more aggressive and irresponsible in their attitude to their legal duty of care for the people defending our forest. Gardner 08 logging coupe was discovered separately by two groups of people one Sunday afternoon after huge logs were seen going through Northcliffe. About this image, the tree really was that big and no thaumaturge has altered the photograph. The dimensions were; widest diameter 4.07 metres, circumference around buttresses 14.03 metres. The timber turned out to be “useless” and now lies on the forest floor. I have heard that a video recording was made of Wayne Crombie-Wilson felling the tree to record what a hero he was. 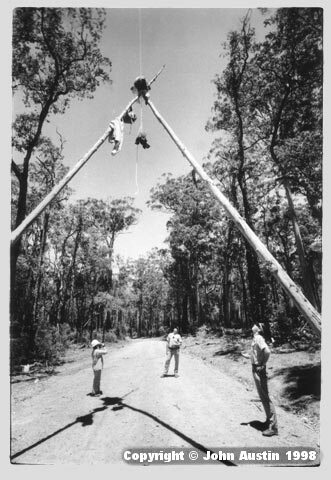 The karri forest canopy aerial performance image was made in January 2005. This session took, I think, four years since Nel first suggested the idea. This image is added as a relief from the seriousness of the other pictures, a dance of grace above a damaged landscape. 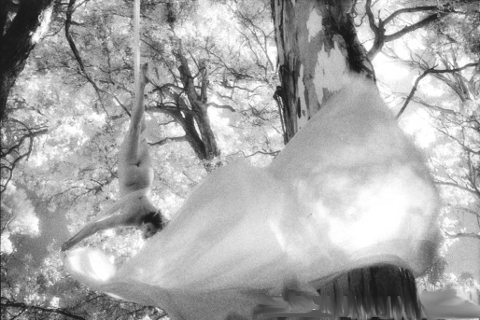 This picture was made using Kodak infrared film to enhance the feeling of unreality. There is also a set of square images with normal film, but Nel prefers the infrared set. 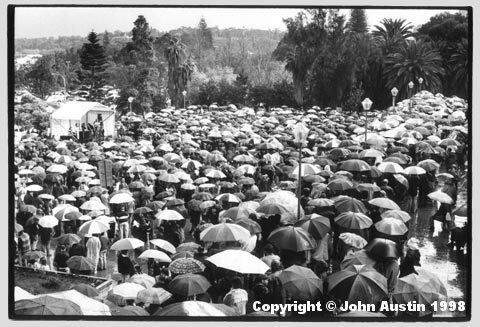 Looking back over the forest protest and rally images shows two historical aspects. For a while I could not see the means depicted from the mid 1990s being used again, apart from public rallies. However the success of Forest Rescue Organisation in getting the James Price Point protest in the media has made me rethink this. From a photographic perspective the use of still film based black and white documentation will probably not have a relevant place, so these will very likely be that last documentary images in this form I will make. We have to formulate new and constantly changing means to keep the forest debate in the public mind and especially in the mind of the youth of today, those who have the most to loose from the unquenchable greed, anger and stupidity of the timber and other extractive industries. Loss of clean water, clean air, safe food and quiet places. These photographs are all limited edition archival selenium toned silver gelatine prints from the original negatives. The mounts are 100% rag boards containing no wood pulp. Twenty five percent of print sales from this show will go to Forest Legacy. Next plans are to turn the forest action documentation pix into CD/videoish thingies showing the whole event from pre-dawn with the protester preparing to be locked in to the arrival of the timber industry, CALM and their Police to the cutting away of the car body to the final removal from a road dragon. I have contacted a prominent WA composer regarding these CD/videoish thingies. Next get help to the the scanning and computer stuffing around part. I need help with this, biggly! A great documentation and a fantastic artist!